Read the EPIC Poetry Group's latest installment of Poet’s Corner, featured in My Edmonds News. About the poet:I’m a longtime, retired high school and community college teacher with plenty of time now for “Fooling with Words.” My active interest in creating my own poetry was launched by that Bill Moyers-titled PBS series in 1998. And lately I enjoy becoming more public with my poetic attempts. I love my present Lynnwood/Edmonds/Sno-King life. The vibrant artistic climate surrounding us here today fills my heart — and my poetic spirit — to overflowing. Paint a picture with words. the acrylics of verbs and adverbs. over the canvas of your soul. You are the artist and author of your life. the precipice where shadow is birthed. reflect shadow in the windows and mirrors of our mind. insight, revelation and musings congeal. new levels of conscious mindfulness previously resisted. deeper into the periphery of light. who cross over before us as the power of shadow is broken. Donna M. Rudiger began her creative writing journey as an adolescent growing up in Pennsylvania; she relocated to the Seattle area in 1974. Donna writes poetry, poetic prose, essay and stories for children. She is a member of the Skagit Valley Writer’s League, the Society of Children’s Book Writers and Illustrators and the Seattle Storytellers Guild. She is a retired technical writer and lives with the wildlife in the woods of Arlington. Cynthia Hénon is a poet and yoga teacher in Edmonds. 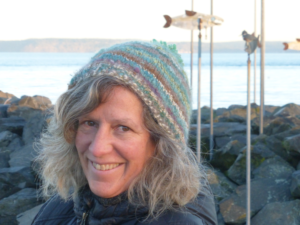 She participates in the monthly EPIC Poetry Group and her work can be found in their recent anthology, Soundings of the Salish Sea. She won her first award, an Honorable Mention, in the Write on the Sound (WOTS) poetry contest in 2018.
the party I wish to speak to. And why do I have to send my social security number out into the ether before I achieve human-to-human status? I’m sorry but that is way past my deadline. I can sprout wings and learn to fly in seven. Why can I never get to my yoga class on time? between 1st St. and 2nd St. It’s May. A gent in navy blazer, khakis and sunhat recognizes his audience. “I think that’s also the answer to life, the universe, and everything,” I offer. “I’ll let you know,” he predicts. “ . . . 59 to here!” comes a report from the next landing. “ . . . 76!” the mad hatter calls down from 2nd St.
“We were there last night!” one of them enthuses. an invitation for a new way, a new way of listening, to come through. Meant for you, the one who knows to hear. Irene Myers, long-time resident of Seattle, now Edmonds, is a career and life coach by vocation, a fiddler of traditional Swedish music by avocation, and a poet by gravitation. In her writing, published and unpublished, she is intrigued by what is waiting to be named. a kitten under bare feet. that had to be cranked up to play a record. on a cot with the washer going. walk in and hoe open as needed. or bedtimes, beds or stories. and Grandma’s soft arms and puffy fingers. on basement shelves in Massachusetts. between Idaho and our home in the east. searches for their own good. In every object, an awareness. to be counted in years. Sharon Murfin is a musician, a writer and a music-thanatologist. She received her M.A. in Fine Arts in Education in Missoula, Montana, where she lived before moving to Seattle. “Writing has been a source of living water,” she says. to the Puget Sound, and to the Olympic Mountains range. Breezes are light; the afternoon sun is bright. begins to speak. We are present to witness the change. Decision point: there is no turning back. Eyes are brimming wet, but voices are strong. In this moment, old sorrows fade to black. to the west as the sun declines to the haze horizon. or will our gathering scatter as we grow old? The wedding party in Cana was underway! the wine was running low threatened to ruin the day. take to the steward this fortuitous fruit of the vine. for saving the best wine for the very last. Jesus was a man of the people, and this was his crowd. for the salt of the earth, as much as love allowed. to celebrate what never took place. the Unknown Soldier did not die. No one was wounded on this spot. Nary a soldier fired a shot. or killed or died or lost a limb. no corpse was lifted onto a shield. let peace begin with us today. Fog is rising from the thawing ground. Birds are soaring without a sound. Cedars shimmer in the morning breeze. Snowy mountains back the trees. For a world at war, where do we start? Peace begins in the human heart. changed hearts lower the gun. changing hearts in the name of peace. Dave Baldwin retired in 2017 from the Walt Disney Company after 40 years as a technical writer and editor. Currently, he is working as a part-time editor for Microsoft. In March 2018, he published a book of lyrics for church anthems. He is collaborating with composer/musician Kerry Lewis of Santa Clara, Calif. Dave lives in Lake Stevens. do they recognize the light steppers from the heavy footed? do they know when I’m coming? why don’t they get out of my way! hell I’m not the Holy Roman Empire! tap, tap, tapping on their heads. Gerald Bigelow is a retired aerospace IT Executive. Previously published in the Arizona centennial anthology, his poetry has also appeared in four editions of Between the Lines. Bigelow is an “at large” board member for EPIC Group Writers, and chairs a monthly poetry group. 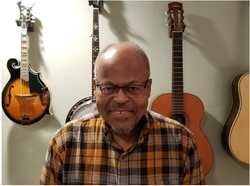 He is the editor and contributor to a recently published poetry anthology Soundings from the Salish Sea, (A Pacific Northwest Poetry Anthology). He was recently selected to read his poetry at an event featuring Claudia Castro Luna, Washington State Poet Laureate.